These are lyrics by Jim Reeves that we think are kind of nonsensical. Billy was a boy kinda big for his size. I suppose the nonsense here is intentional, aimed at being whimsical. But "big for his size" makes no sense. Whatever his size is, it is just that. One can be neither big nor little for one's size. A similar (and I suppose intentionally) nonsensical phrase that I've heard is "young for his age". Jim Reeves', "Bottle, Take Effect"
Then just lead me to those lights of blue on the corner of regret. What shape is regret, that it has any corners? Triangular, square, or pentagonal? Or maybe even a cube or a dodecahedron? 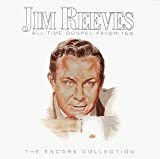 Jim Reeves', "Welcome To My World"
Step into my heart? I'd like to see that happen! On second thought, no one should ever attempt such a thing. And was any world ever built with anyone specific in mind?